Locked Up In Less Than 8 Hours–5717 Morgan Avenue S.
Repatriating to Minnesota, getting married, getting a dog and renting a nice albeit very small apartment near Lake Calhoun sounds pretty darn cozy and romantic, no? Well, certainly for a little while. But eventually, the space starts to feel way too tight. What of entertaining? What of maybe adding a second dog to the clan… perhaps even a German Shepherd! Meanwhile, a co-worker suggests calling Tim, to learn more about perhaps seeking out and buying a first house. An initial meeting at Turtle Bread over several cups of coffee soon follows. And that very same weekend, the search for a new home ensues–boots on the ground, keys out of the lock boxes… all of it. It was the fall of 2017. 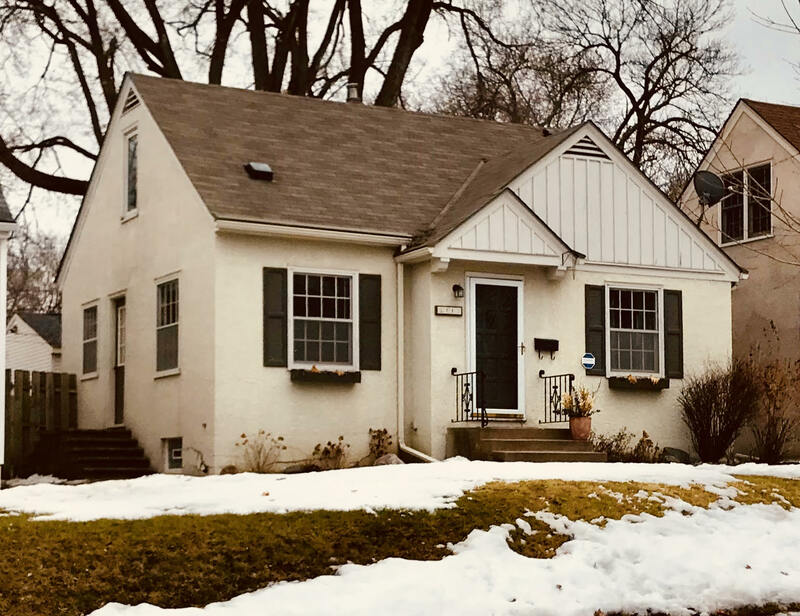 Sean and Laura, being well connected in the community and savvy consumers, were acutely aware of the difficult market buyers were facing earlier in the year in their preferred South Minneapolis locations. So they were hoping to find a home over the winter, when things might cool off (literally and figuratively) in the red-hot housing market. Most years, the winter is a slightly better time to buy a home. Of course there are fewer listings to choose from, but usually even fewer buyers competing for those listings. But this winter was not like other winters. The flocks of buyers going through showings and open houses and the accompanying frequent multiple offers never seemed to slow. Efforts to find unlisted homes were becoming less productive as more and more sellers wanted the exposure of pursuing full-on MLS listings. By February it was clear that avoiding multiple offers would be difficult and the ‘spring market’ was already beginning. Around that time, a home in the Armatage neighborhood in SW Minneapolis was listed. It had all the makings of a property that could, just maybe, get snapped up before going into a bidding war. How could that be? Well, it was clearly a great property for the price. But it had sellers that was potentially showing signs of a willingness to take a ‘sure thing’ quickly and ‘be done with it.’ The photos and showing condition could have certainly been better, and chances are that the sellers were probably aware of that. It felt like the sellers ran out of resources or energy to present the house in its best light. Meanwhile, by this point in their search, Sean and Laura were completely clear about what they wanted, and this house fit the bill. It had just the right amount of work needed. And they had been in the field, knew the market very well and were decisive. Almost immediately they instructed Tim to move with haste in putting an offer together. After some brief discussions with the listing agent, they were able to tailor some of the terms of the offer to entice the seller into signing quickly, and within 8 hours of the showing, Sean and Laura had locked up a purchase agreement. Against the odds, they had avoided the dreaded bidding war and found a great house. For more information on today’s market and how Tim helps buyers like this compete in this historically low-inventory market, please email Tim at tsipprell@kw.com or call him at 612.327.7657.